You are here: Home / Why should a CFO tweet? 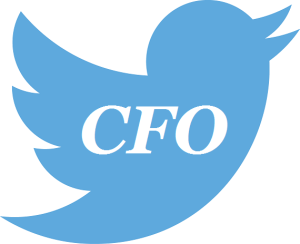 Why should a CFO tweet? I blogged about CFOs and Twitter three years ago. Since then, practically nothing has changed for CFOs and Twitter. And this is a mistake. Time. CFOs use this reason as a crutch for many things they don’t feel is important. Irrelevant. CFOs do not feel that this social media tool is relevant to them. Other CFOs don’t tweet. While this is true, this is never a reason not to do something. They don’t get it. This, I think is the real reason CFOs do not tweet. CFOs generally do not understand how to use it and do not understand why they should use it. So let’s address the real issues. Reasons why a CFO should use Twitter. Not being on Twitter limits your visibility. One of the keys to success for a CFO is to be visible. Does a CFO who is invisible actually exist? In the business world today, if you are not on the Twitter channel, you may not exist. Twitter impacts your brand. If you are on Twitter and use it even just a little bit, you can easily brand yourself as someone who is ‘with it’. As many CFOs struggle with how to stay relevant within their organization and their career, using Twitter is a small investment that pays off big dividends on your personal brand. A well branded CFO is a successful CFO. Few CFOs will admit to being master networkers. While tweeting is not networking, it is a tool that supports networking by sharing information with those that know you and those that want to know you. Social media supports networking, and Twitter is a channel that any CFO serious about networking should be part of. An effective CFO knows how to listen. Twitter is now a mainstream channel of information, and if you are not on it, you could be missing information being said about things you care about, including what others are saying about you. Any time you are at a conference or in public, having a Twitter handle allows others to talk to you directly. You may want to hear what they have to say. With Twitter, you can not only listen to what people have to say about you. You can be part of the conversation. Imagine for a moment you are presenting at a conference. With your Twitter handle, audience members can reach out to you directly about what you said, tell others and spread your brilliance, and interact with you directly. I have been to too many CFO conferences where CFOs talk about what they want to share, and because they are not on Twitter (which is most of them), they miss interacting directly with the people who are there, not to mention the ability to reach others way beyond the room. As CFO, if you are on Twitter, please reach out and tweet me @DergelCFO. If you are not on Twitter yet, and would like to know more about how to work with it, you can find many resources online, including this Twitter Tip Sheet from Donna Papacosta. What I said on my blog three years ago bears repeating. Twitter. It’s good for you. And you might actually like it.